Home / Business / What is Business Value? What is business value? Everyone talks about it, yet it seems to be a very vague and broad concept. Also, what are “business problems”? How do we address those problems and how do you then deliver business value? More often than not, business problems are related to one or more of these four elements, such as an organization’s ability to reduce response times to their customers, or a company’s inability to test a new product or service in a new market segment, or for new personas to evolve quickly and repetitively. Digital Decisioning platforms (i.e., AI; Machine Learning, Classification, Neural Network, Analytics, Business Rules, RPA, etc.) can help organizations to improve some aspects of the business that impact those four elements. Yet reports show that these platforms were unable to deliver the business value effectively and continuously. No actionable output/result. If the result is simply a dashboard or a prediction and so on, these cannot get people to do something differently simply because they are not actionable. Solving the wrong problem. The problem that is solved with the platform has little or no impact on the business value. It could be a technical/hard problem to solve, but this is not necessarily related to any business problem whereby solving it has an impact on the business value. The platform is hard to use. People who need to use the solution cannot understand how to use it. It’s a technical focus solution for implementation and this does not cover the business aspects of the problem. It is expensive. The cost of building, using, reusing, deploying and getting value from the platform is expensive. Something about it makes people feel that it is too expensive, therefore ‘I am not going to use it or act on the result’ (trust issue). No Integration. The solution and results are not integrated or it is hard for these to be integrated into front-line processes and systems. As a result, it has no impact on the way people do things in the organization. Most of the time, organizations think only about the business problem or stated goals. Then they go straight to data, rules and solutions implementation. For example, a loan provider might wonder, “How do I increase the rate of approval?” Putting the business problem first is a great first step. This can become a metric to measure success. However, it is essential to peel back the onion in much more detail and understand the decisions that are involved. Given what organisations want (e.g., increasing the loan approval rate), what business decisions do they make that have impacts on what they are ultimately hoping to achieve? Answering this question and thinking in terms of approaching a decision is not about technology and algorithms, but it is simply about understanding business and what decisions they make currently and how these impact the current state. A sample Loan Approval strategy that identifies whether to approve the loan automatically, decline it straight away, or involve a review team. 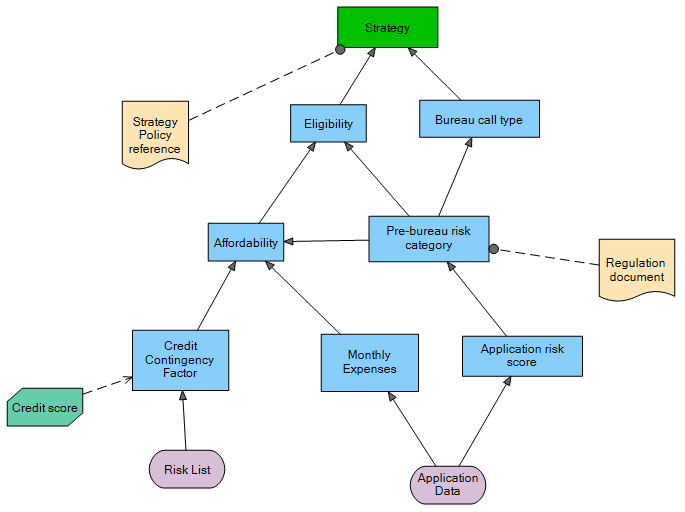 This model involves all business decisions, regardless of the technology or algorithm used. It ensures alignment between technology and what matters to business (the decision), and how this delivers business value. Shows what impact these have on the business, price, time, etc. It becomes clear what to measure and monitor in order to understand the impact. How can the Decision Centric Approach address these challenges? 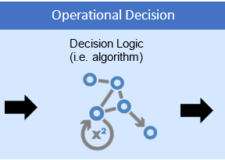 The Digital Decisioning platforms embraces all kinds of decision-making models (i.e., machine learning, analytics, neural networks, etc.). We do not need to care about the type of decisioning model at this stage. What we care about is enabling the organization to change their behavior by using the solution provided and subsequently getting business value from that solution. 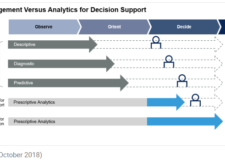 On the other hand, the decision-centric approach will help technical resources (i.e., AI, Analytics, IT teams, etc.) to work on the problem that has the broadest impact within the organization. Bringing together all decisioning technologies (i.e., AI, machine learning, business rules, statistical analysis, regression, classification, etc.) that are available in a single, easy-to-deploy and manageable decision model. Enabling the business impact evaluation. This is not just about technical evaluation of the decision or the accuracy of the decision, but also understanding the business problem that we are trying to solve. Will this decision have a business value and impact? Enabling business to monitor, measure, adapt to changes and redeploy the decision model incrementally and iteratively. 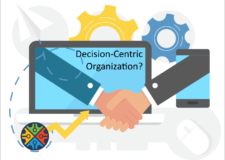 decision-centric approach delivers business-value-driven, consistent and explainable outcome by visible, transparent and measurable business decision models that are easy to understand, communicate, change, deploy and technology/algorithm agnostic.